What do you get when you combine the rainbow food trend with the world's second-most Instagrammed food? The gorgeousness that is #rainbowsushi. If you thought sushi was beautiful before, wait till you see the rolls of many colors. Whether laid out on the mat, already rolled into beautiful bundles, sitting on a cutting board or meticulously plated, it's hard to find a food prettier than these rainbow creations. So it's no wonder that #rainbowsushi is taking over Instagram, with more than 2,000 posts and tons of reposts. Sushi was already so colorful before we started decking it out in food dyes. 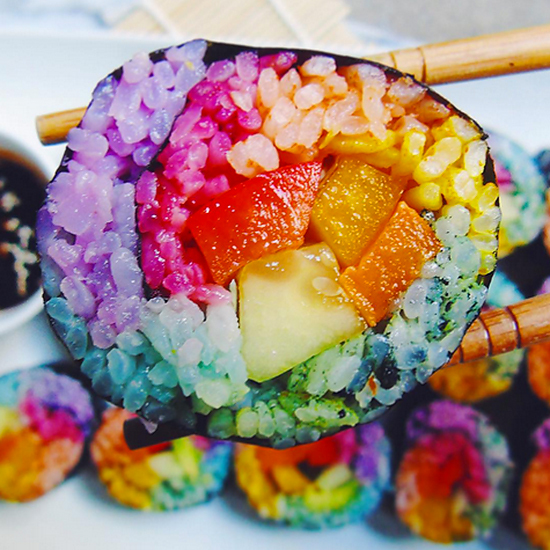 Now, with its gorgeous gradients of colored rice, this sushi can put even Munchkinland to shame. There's something for every sushi lover here. Do you like it drowned in sesame seeds and filled with all the colorful vegetables? Or do you prefer to keep your maki simple, filling it with straight avocado? Do you require that all your sushi contain fish or is it enough for the rolls just to be plated so beautifully that it may ruin you for all other foods forever? Do you want to see this beauty in process or would you rather look at the impeccably crafted final product? Still not over rainbows after all that sushi? Check out the sprinkled-out rainbow bagels that were so popular that it shut down the whole bagel store, the rainbow lattes you can make at home, and the gooey gorgeousness of rainbow grilled cheese.